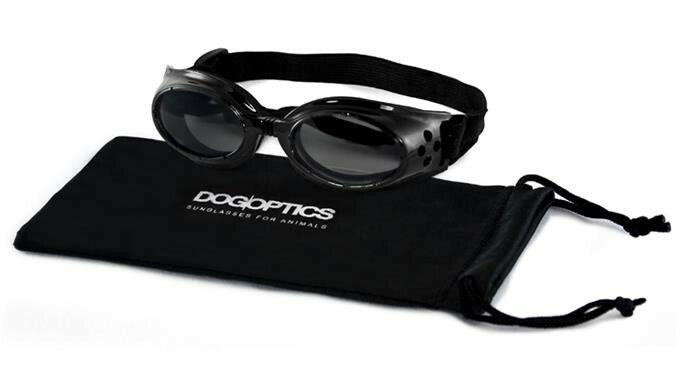 A tough black sunglasses for dogs that will fit perfectly. These sunglasses for dogs is made of sturdy plastic. 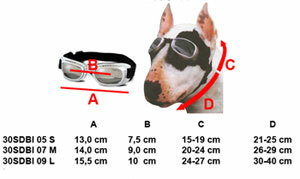 The sunglasses are perfect to use if for example you take the dog in the convertible, bike or motor. The glasses has ventilation holes on the sides so the sunglasses will stay clear. 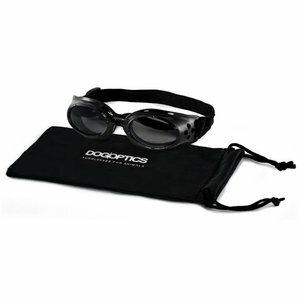 Your dog will wear the glasses comfortably since it is equipped with a wide soft foam layer. The eyes of your dog are well protected from wind, sun, UV rays, dust and snow. These black sunglasses have mirror lenses and comes with a storage bag. Available in S Please have a good look at the picture for the correct size!